Garden Tiles is an original quilt pattern for a geometric "stained glass" style quilt, written up in five sizes using easy strip piecing and rotary cutting. 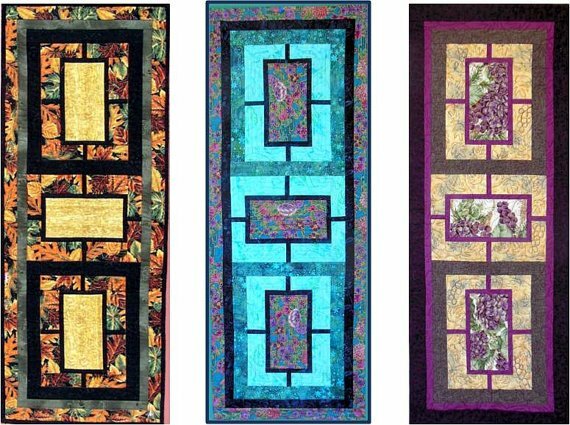 Make a striking queen, double, twin, lap quilt or table runner using this pattern. All five sizes as well as two block sizes are included. Bonus instructions are given for placemats and for a sixth quilt size. This quilt pattern is suitable for the quilter with confident beginner rotary cutting and piecing skills, including an accurate scant 1/4" seam. The pattern contains a detailed rotary cutting chart and illustrations of all strip piecing and quilt construction steps, as well as possible variations and quilting suggestions.